Spinning Three New CNC Turning Machines | KLH Industries Inc.
Ken Heins, President and CEO, operates KLH Industries with a simple motto, “Sell what people want to buy.” The message is clear; people want CNC turning. With the voice of the customer resonating in mind, KLH has purchased three new Doosan turning centers. The combined 20-tons of machine weight means more CNC turning capacity with CNC milling capabilities. 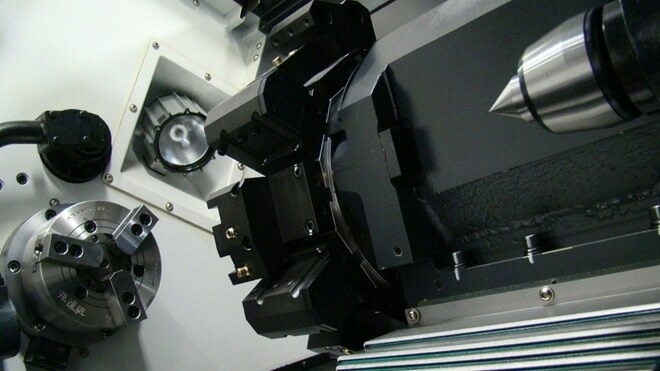 Turning machines equipped with live tooling are more aptly called turn/mill centers. These machines have motorized turrets capable of independently rotating tools like a milling machine. Secondary operations, like drilling, tapping, and boring, can be performed without secondary setups and additional labor time. Just like a value menu at a fast food restaurant, KLH is accepting orders for small, medium, or large sizes. Each machine is adept at turning for a particular niche, generally relative to the size of the diameter. The smallest of the new arrivals, a Lynx 220LM, brings high speed on high precision turning. The Puma 300MC, on the other hand, is a mid-size turn/mill center that screams efficiency. Living tooling removes the need for secondary machining and additional handling. A bar feeder continuously feeds raw material, while the parts catcher collects finished parts without stopping the machine. The 300MC’s size and versatility make it a perfect mid-size compliment for KLH’s precision turning services. The largest new turning center is a familiar face to KLH because it’s the second Puma 480L model on the shop floor. Capable of chucking 25” diameters up to 80” long, it’s no surprise the heavy cutting 480L was well liked enough to bring in an identical twin. With a 60 HP main spindle, the operators will start seeing metal chips in their sleep. All three machines are delivered, tested, and operational. KLH has enough CNC turning centers to make your head spin, but we’d rather spin your next project. For more information about capabilities or when to use this service, visit CNC turning, or contact the CNC manager.